Our Wal-Mart ‘campground’ was rather noisy last night as we were very close to a busy highway. On top of that, from about 06:00 there was an almost constant sound of a ‘beep-beep-beep’ alarm on a fork lift truck, or something telling the blind, but not the deaf, that it was about to run them down. I slept pretty well but The Chef had a bit of a rough night. Following a nice hot shower, breakfast and a journey of about 5 miles we arrived at Niagara Falls State Park. It was only 08:00 and so we had our own private car park for cars & RV’s at lot #3 on Goat Island. In fact throughout the day we never saw more than three other cars on the car park, but I bet it’s heaving there during peak season. The State Park and its attractions are spread over Goat Island which is about ¼ mile by ½ mile, and to save time we decided to get the folding bikes out. Almost immediately we were riding alongside Niagara River with lots of lovely white-water which feed the Falls. I had always imagined that at Niagara you looked up at the Falls, either from a boat or observation position, yet here we were stopped right at the edge of the top of Horseshoe Falls as the water poured over and in to the river gorge below. We were so early we didn’t have to share the moment with anybody else. Taking advantage of the situation we paid for the ‘Cave of the Winds’ tour where, for $10 each you’re given a pair of disposable flip-flops and a plastic poncho before descending in an elevator towards the base of Bridal Veil Falls before following a wooden walkway. This tour was fun, and I was mad enough to step out into the path of most of the water spray coming down which got me very wet, even with a poncho on. I also saw beneath the waterfall the most amusing sign so far, it said ‘No Smoking’. I couldn’t imagine anybody desperate or mad enough to try and light a cigarette in what is the equivalent of torrential rain. Anyone who succeeds should receive a free lifetime supply of cigarettes from the manufacturer. I even questioned it in a light-hearted way with one of the Rangers and he said some people do try, but he’s never known anybody to keep one alight for more than 2 seconds. After ‘Cave of the Winds’ we donated our flip-flops to people in the Third World as protection against soil-bound parasites which can be very harmful, though the unluckiest of those people probably avoid soil-bound parasites but get athletes foot and verruca’s instead. We were disappointed to see how few pairs had been donated until later in the day when we realised that the better informed visitors held on to them to wear on the ‘Maid of the Mist’ boat ride to the base of Horseshoe Falls. I do hope they donated them after that. This was to be our next stop. There are two large boats which leave from the Canadian side of the river, and one small one from the American side. We were on the American side and the queue was shorter. This was a very enjoyable ride with me again trying to keep the video camera dry with a clear plastic bag. We did get issued with another plastic poncho, but that was all. First the boat passed American Falls and Bridal Veil Falls then on to Horseshoe Basin where passengers get thoroughly drenched by the spray, as water thunders down the famous Horseshoe Fall while the boat gets close, then does a ‘U’ turn and returns. Good fun and great value at $12.50 each. After this we decided to make our way back to the RV to dry off a bit and have some lunch. We’d then put the bikes away and use the free Trolley bus service to return. 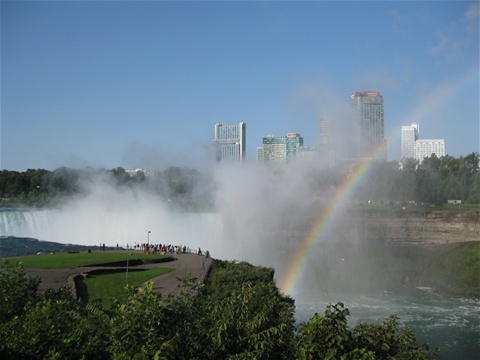 Our intention was to cross over Rainbow Bridge on to the Canadian side of the gorge for a better look at the Falls and a trip to the top of the Observation Tower. On arrival back at the Visitors Centre we had a short walk to the bridge, only to discover that starting Monday (TODAY) until Friday the sidewalk over to Canada was closed due to repair work, and to top it all there was no alternative means of crossing the bridge being offered to pedestrians. Surely it would not be beyond the wit of man to provide, for a fee, shuttle buses across the bridge. So, annoyingly, we’ve seen Canada, but we’ve yet to visit it and it also meant we missed out on the Observation Tower and the walk under Horseshoe Falls. On return to the RV we put our feet up for a while relaxing in the warm sunshine at our large, peaceful, almost private car park, Lot #3, Goat Island. We’d decided to try and miss some of the rush hour by leaving at 17:30, thirty minutes before the park was due to close. Just before setting off a middle aged chap and his wife pulled up in a car beside us and enquired if we were allowed to park our RV there overnight. I told him that since it was such a lovely quiet spot, we had enquired, but was told the policy is no overnight camping on any city parking lot. The chap explained that they were staying in their RV at a ‘Good Sam’ campground somewhere local and costing them about $50 a night. They thanked us for the information and as they drove off The Chef noticed a rear bumper sticker on their car saying ‘God Is My Pilot’ which should have had a rider to it stating ‘And Flew Me to the Philippines Where I Got Me a Very Much Younger Wife’. We made our way to the Wal-Mart store at Amherst for another free nights camping. This meant our two night’s accommodation; food and attraction fees at Niagara Falls has cost us about $80, about £47 in total, which is pretty good value. As I had allocated 2 days for our visit to Niagara Falls we were now one day ahead of schedule again and so tomorrow we plan to go around the coast and visit Hamlin Beach State Park on the shores of Lake Ontario for an overnight stay before striking out eastwards for Boston Massachusetts which is a journey of about 400 miles. LOCATION TONIGHT: Wal-Mart, 2055 Niagara Falls Blvd, Amherst, NY 14228.